This lovely schematic diagram was first created in 1939 by George Dow. 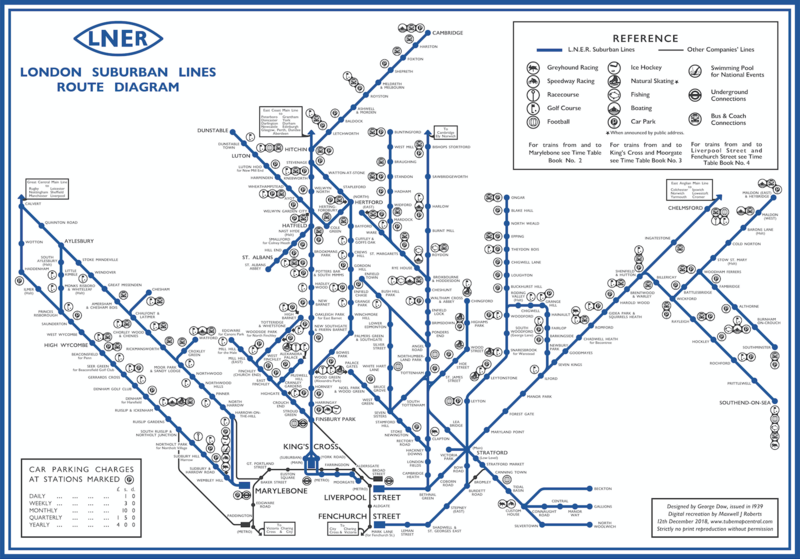 It shows the three LNER (London and North Eastern Railway) north London networks – radiating out from the Marylebone, King’s Cross, and Liverpool Street/Fenchurch Street London terminii, in a single map. Unusually, the map includes a series of pictograms, illustrating nearby facilities, leisure and tourist activities to each station. 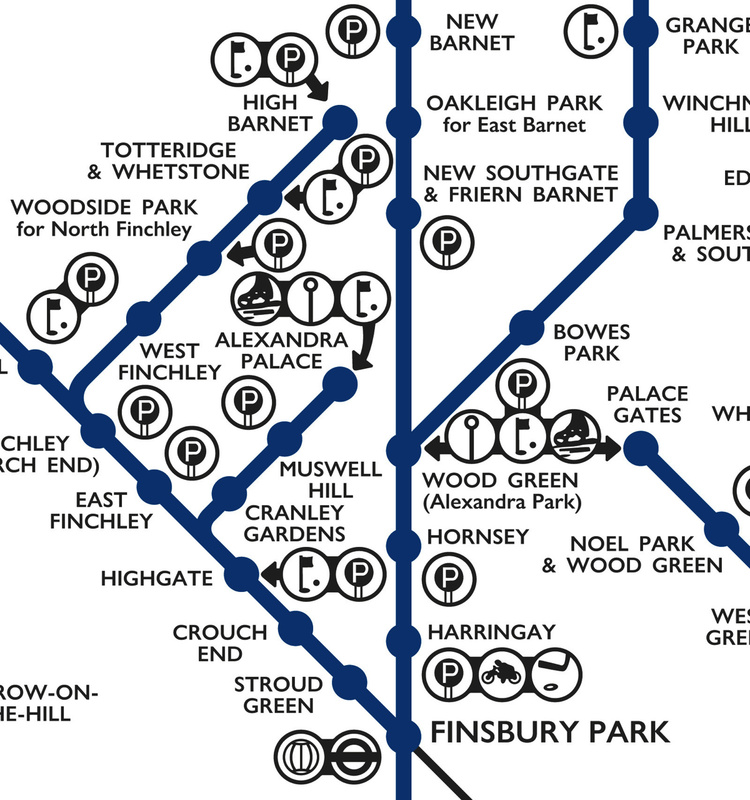 Dr Maxwell Roberts (of Tube Map Central) has recreated this map digitally, using a replica font, icons specially created by Doug Rose. 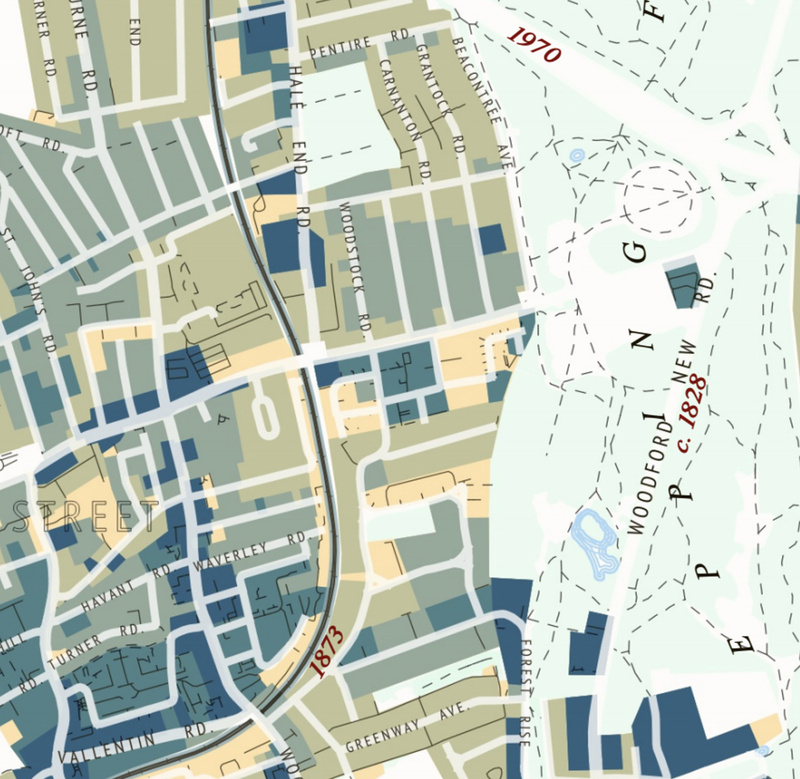 It means we have a full digital vector representation of an 80-year-old map, allowing for reprints of the work at extremely high qualities and resolutions. 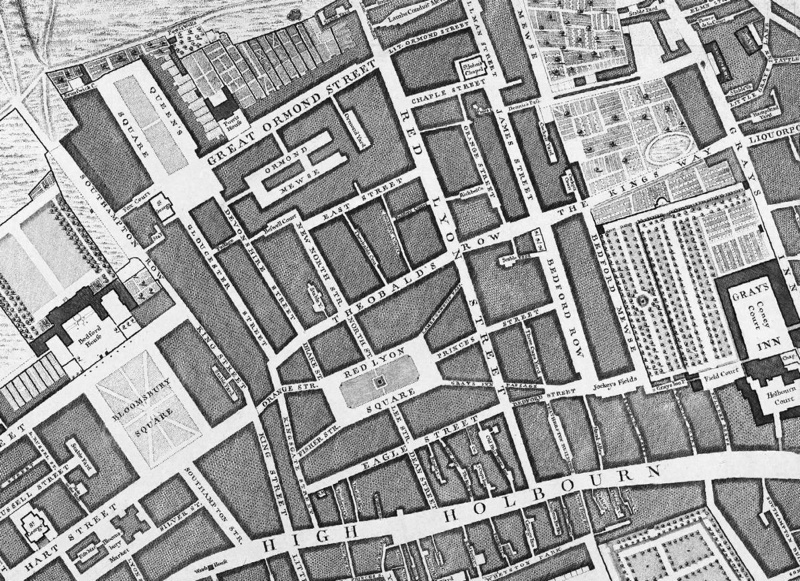 He has also improved on the cartography of the original, making it a strict octolinear map (that is, straight lines meeting at right angles and 45 degrees only) like the more famous Tube map – the original had bent quite a few lines subtly to fit the detail in. The network itself has remained surprisingly intact over the last 80 years, with most of the lines still serving commuters daily. The most notable closures are the Buntingford line, and the Muswell Hill and Palace Gates branches near Wood Green. 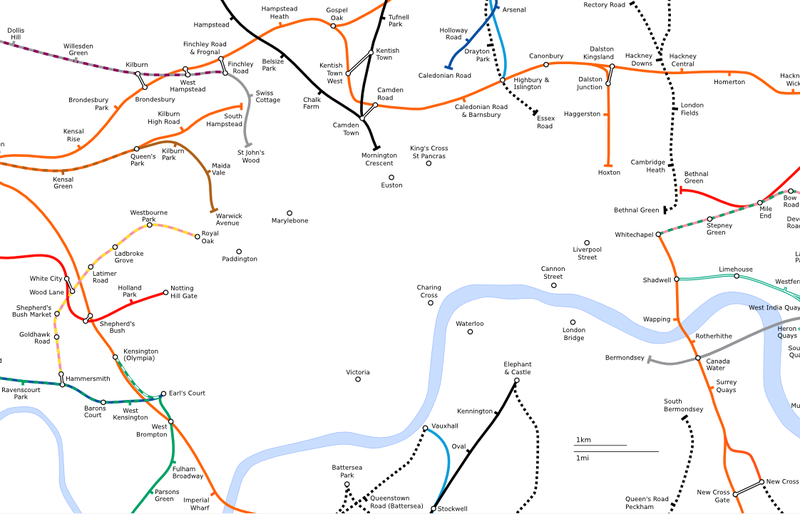 Several others have converted into London Underground lines – you can see parts of the modern Metropolitan, Northern and Central lines, and the DLR. There aren’t many Greyhound Racing, Speedway Racing or Ice Hockey facilities left, though. 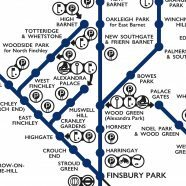 An obvious extension would be to adapt the map to reflect the modern north London suburban commuter rail network layout, and the change in facilities and attractions, while retaining the vintage look of the map. 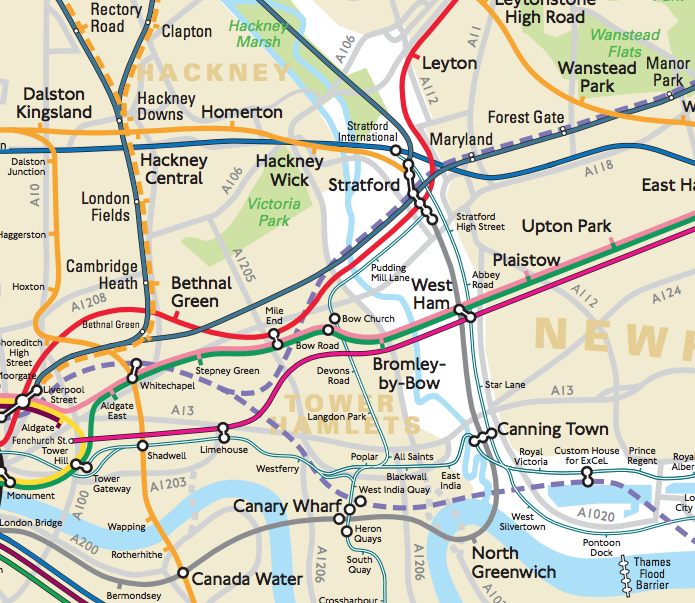 You can explore many other original maps of London’s transit networks, at Tube Map Central. 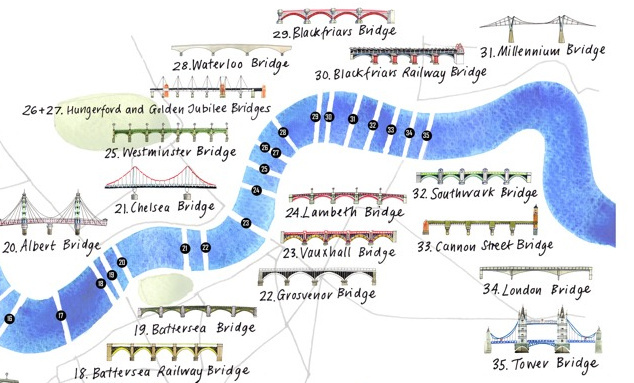 Thanks to Dr Roberts for giving permission to reproduce his map, and sending the high-resolution except here.